The last Saturday of every July is National Dance Day, which makes it tomorrow! The closest Six Flags is quite a ride from here to participate in the group numbers choreographed by the So You Think You Can Dance crew, so I'll be celebrating at home. Find out how by reading yesterday's It's the Sparkles and the Shimmies, a guest post by belly dancer AJ Reardon. Like many little girls, I dreamed ephemerally of being a ballerina when I grew up. I took tap, jazz and ballet as a child, but my interests twirled onto other artistic things in middle school. Feeling nostalgic, today I slipped on my ballet slippers and pirouetted around Etsy's stage. 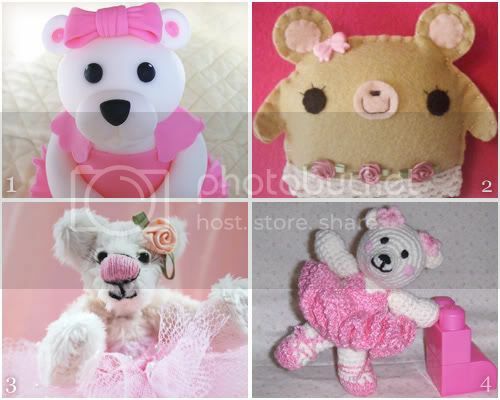 These adorable ballerina bears joined me in the limelight. 2. Emma the Ballerina Bear by Hello Happy! Have fun with the dance tomorrow, I may twirl around the kitchen a few times myself. I take it you watch the show, do you have a favorite? I am absolutely in awe of Melanie, Last week her number with Niel gave me goosebumps. Indeed I do, Marlene! They're all amazing dancers, but Melanie is my favorite, too! She's adorably unique. Marko is a close second, wow. So cute!! I love the fondant bear! I'm so torn between its cuteness and wanting to eat it!